American Aquascapes brings the benefits of water features to businesses and homes in Chapel Hill and throughout the research triangle area. Experts at designing, installing, and managing aquascape ponds of numerous sizes and shapes, American Aquascapes knows what it takes to create a balanced and beneficial water feature. As the area’s premier pond builders, American Aquascapes has earned multiple industry recognitions, pond design rewards, and great customer testimonials. Welcomed by North Carolina residents for over a decade, we look forward to helping you enjoy a relaxing aquascape design that increases the value of your home or business. Since Chapel Hill’s founding, the community has been dedicated to larger causes. The original town was literally created to serve the University of North Carolina, and grew up around it. This dedication to the pursuit of knowledge extends to nearly every aspect of Chapel Hill. Today, residents enjoy a well-organized, well-designed, and growing city that continuously seeks balance with it natural environment as it expands. This may be partially why many residents have enthusiastically embraced pond construction and water feature installations throughout the area. The benefits that backyard ponds provide to both people and wildlife make them ideal for enjoying the conveniences of city living with a relaxed country feel. When the grill is turned off and outdoor patio cleared of an evening’s meal, there can be little else to entice a family to remain outside. Our private outdoor spaces should invite us to enjoy a warm summer evening together. As part of a creative garden space, a well-designed and expertly installed ecosystem pond, pondless waterfall, beautiful fountainscape, and even a more contained patio pond, creates the opportunity for relaxed enjoyment that benefits everyone. With the right mix of colorful fish, beneficial plants, and an easy-to-maintain filtration system, your backyard will always beckon you and your family to enjoy the serenity. Living waterscapes invite multiple types of birds to splash and play in the hot afternoons. Dragonflies dart between and around aquatic plants while feeding on mosquitos, reducing their population. Smaller woodland creatures sneak sips of fresh water as they forage. The moment your Aquascape Pond is installed, your backyard paradise will become a living landscape and small haven for the local wildlife that exists around us, helping to bring your property into greater harmony with the natural world. This invitation to your local wildlife also creates educational opportunities, helping whole families interact with and better understand the natural world. 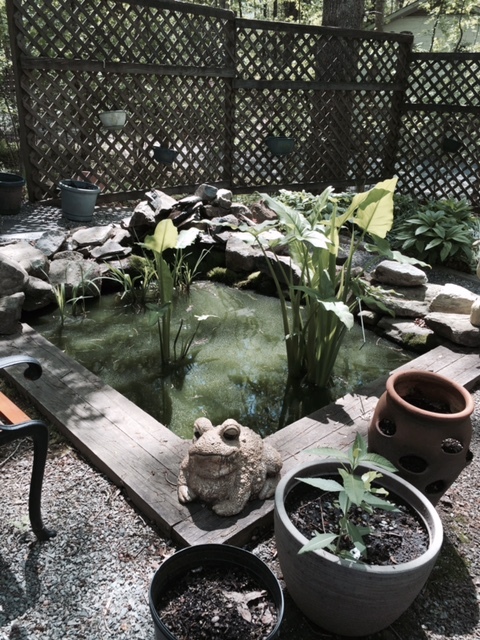 During the hot days of a Chapel Hill summer, a pond’s evaporative cooling effect can even act as an outdoor air conditioner, while waterfalls and similar pond elements can help create living landscapes that capture and remove low-level air pollution, pollen, and other irritants. For many, the sound of a waterfall or gentle small stream are among the most relaxing and beneficial for the mind and body. Not only can pond installations help mask the intrusive sounds of the world around us, they can have the ability to calm our thoughts, inspire our creative impulses, and even measurably lower blood-pressure. 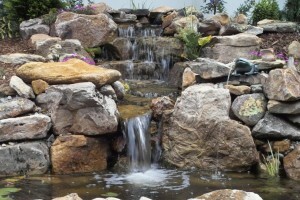 A well-thought aquascape design also adds a significant dose of beauty to the therapeutic benefits of a water feature. Helping us to better enjoy the restorative powers of relaxing outdoors with a living waterscape. The size of your outdoor space may require creative adaption from a design expert, but should not limit the ability to install a beautiful aquascape and enjoy all of its benefits. Whether an ecosystem pond, pondless waterfall, beautiful fountainscape, or a more contained patio ponds, pond installations come in a variety of enjoyable shapes and sizes. Far from being a constraint, the ability to adapt a space to fit your unique vision is one of the benefits of high-quality aquaspace design and expert installation from certified pond contractors. Be it an active and bubbling stream running throughout your property, a quiet corner to relax and enjoy the benefits of a pond, or a living waterscape bubbling with Koi, there are many options available to fit every type of space and style preference. Enhancing the beauty of color landscapes, turning your private space into a backyard paradise, providing yourself with that perfect area to rest and relax. The type of water feature you install will be guided by your vision for its purpose. Budget limitations, the available area for the water feature, along with access to a power source will also be factors impacting the overall look and feel of your Aquascape Pond. Much like the creation of the water feature itself, your overall budget may require the assistance of experts, but should not serve to limit your vision. Working with experienced pond contractors who are licensed, insured and maintain a good reputation for installing and maintaining Chapel Hill ponds is the best way to guarantee the results match you what you want to achieve. Certified contractors will always walk you through Koi pond care and the maintenance of your aquaspace pond, while patiently answering any questions you may have. For a typical pond, you should expect no more than a few hours of pond management during warm months and it is always a good idea to contract a pond cleaning service for regular cleaning. Ponds and similar water features represent the best way to add beauty to your outdoor living space. For nearly two decades, American Aquascapes has worked with Chapel Hill residents and businesses to create and enhance high-quality creative garden spaces. When looking for expert pond contractors, pond cleaning services, and extended koi pond care, you can rely on the experience of American Aquascapes to help you create the backyard paradise you deserve.